codeREADr is dedicated to innovating event access technology. We often hear from our clients about the difficulties of managing re-entry at events. This is especially true for events that accept “print at home” or mobile tickets. This is because print at home or mobile tickets are very easily reproduced, doctored, or faked. We just released ‘photo-postback’ technology for our codeREADr app. Photo-postback technology can be integrated with ticketing and access control systems, or it can be independently deployed. This feature doesn’t require access to or integration with an event’s ticket database. 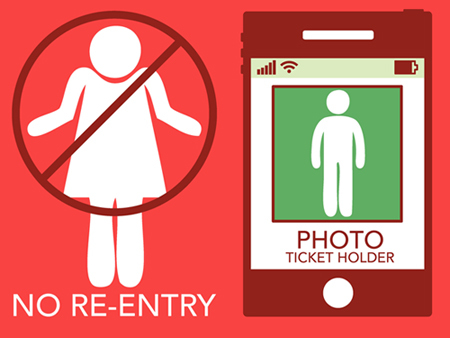 When a patron temporarily leaves a venue, an attendant will use the codeREADr app to scan their ticket. The attendant can do so with either an iOS or Android device. This includes tablets, iPods, or phones. Then, the attendant would take a photo of that patron. The ticket ID (data collected from the scan) and the photo of the patron will be linked. This data will also be stored in your own Dropbox folder. When the ticket is scanned with codeREADr upon re-entry, it will be validated. Then, the stored photo from your Dropbox folder will be presented for visual verification. Want More Info About Event Access and Mobile Tickets with codeREADr? For a short video and step-by-step instructions please look here. Photo-postback is available with our standard and SD PRO scan engines – see video here. Would This Added Security be Worth $10-$20? You tell us. We welcome your comments, including feature suggestions, for all things event access. Would you like to try it on your own phone or tablet? If so, please let us know. Email us at support@codereadr.com. Whether you’re an Android or iOS developer, Fortune 500 or startup, we want to hear from our readers and clients.